Whether supervising a beach or a swimming pool a lifeguard commands a great deal of responsibility and respect, and as such needs to be fully prepared in the practice of their art. 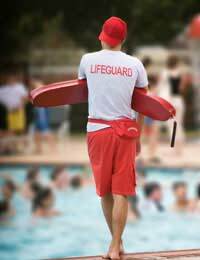 A lifeguard is responsible for overseeing the safety of the users of a beach or swimming pool. Lifeguards are typically strong swimmers trained and certified in water rescue, cardio-pulmonary resuscitation (CPR) and first aid. Although a lifeguard is there to save lives, their primary role of any lifeguard is to prevent incidents occurring in the first place. Therefore a measure of the effectiveness of a lifeguard force is not the number of rescues but the absence or reduction of accidents. Sit on a raised observation deck or elevated chair at the poolside to keep a close watch on the pool and its users. Keep a keen eye out for swimmers and bathers in difficulties. Curb behaviour that might be dangerous. Advise swimmers on the use of diving boards and slides. Check water temperature, pH and chlorine levels. Supervise beach users from an elevated vantage point. Prevent accidents by identifying hazards and taking preventative measures. Advise people where they can swim safely. Make sure beach users stay within the safe zones. Provide a point of contact for beach users. Apply life-saving techniques in emergencies. A typical beach lifeguard course will teach students how to judge tides, weather systems and currents and how to prevent an emergency situation from occurring. They will also be instructed in open-sea rescue skills, spinal injury prevention, CPR and first aid. A pool lifeguard course will include the same basic rescue and medical skills but instead of focusing on sea conditions will look at diving supervision and other poolside activities. In general, to become a lifeguard, applicants will need to be fit, confident and strong in the water. Pool lifeguards need to be over 16 years of age and beach lifeguards over 18. Able to complete 50 metres front crawl in less that 1 minute. Able to complete 50 metres breaststroke in less than 1 minute 20 seconds. Swim 25 metres on their back. Demonstrating deep water recovery by recovering a brick from the pool floor. However a good lifeguard is not just a good lifesaver. They will also have excellent observational and communication skills, a tactful but firm approach with people breaking safety rules, good team skills, and the ability to concentrate, remain calm and inspire confidence. If somebody finds themselves struggling in deep water, a nervous lifeguard with little idea what to do will not offer much reassurance. For this reason all lifeguards must acquire the appropriate qualifications before practising their art. To qualify as a pool lifeguard candidates will require either the National Pool Lifeguard Qualification (NPLQ) or the National Aquatic Rescue Standard (NaRS): Pool Lifeguard, two international recognised certificates. NPLQ courses are available at approved centres based at local swimming pools. It is advisable to have reached a good level of swimming ability and have some experience of lifesaving before taking the NPLQ qualification. This could be obtained by taking a few of the RLSS lifesaving awards beforehand. Prospective beach lifeguards will need either the RLSS National Beach Lifeguard Qualification or the National Aquatic Rescue Standard (NaRS): Beach Lifeguard to be accepted. To obtain these qualifications it is recommended to either join a local Royal Life Saving Society UK (RLSS) Lifeguard club or Surf Life Saving Association (SLSA) GB Life Saving club as a volunteer and train with them, or otherwise train through a commercial training organisation.